".. Anything is toxic in the body, they must retreat and go out .." he says Mathioli, praising the effects of this wonderful herb .. and it may not be just an alcoholic or a history of jaundice, help to appreciate the beautiful and much of that medicinal thistle .. 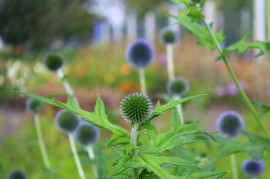 Milk thistle is very decorative and tall thistle, which is the highlight of every garden. To delight the eye as well as therapeutic purposes is grown in our country, is quite modest in terms, but most he will fare in a place with plenty of sun. It occurs as an annual or biennial that blooms the second year. Its flowers are purple color, as it is known in most of thistles. Spiny leaves of this plant have a typical white grain, according to which the best know milk thistle. Previously used mostly for the treatment of leaves and roots, today it is mainly the seeds from which the preparation of tea, tinctures, oils, capsules or tablets. Seeds are collected in late summer vyloupnutím and dried. Because in our significant healing effects milk thistle are coming in to awareness of its seed products are now commercially available. Due to the unusually strong beneficial effect on our liver is that for many of us literally priceless medicine .. Milk is undoubtedly one of the best proven natural cures for liver disease and their overall recovery. It is due to a substance called silymarin, which is considered one of the most effective in terms of recovery of liver tissue. Treating the cured or fatty liver (cirrhosis), but also the consequences of infectious inflammations, such as jaundice. The effects of silymarin are so distinctive that even successfully used for regeneration of severely damaged liver in treated drug addicts and alcoholics, and people with impaired liver function due to prolonged use of synthetic drugs, after chemotherapy or poisoning toxins of various kinds, as well as for mushroom poisoning, etc . Suitable and where the introduction of the liver was either due to poor diet, or nadvýživy, therefore obese humans. Deprive our body as well now so common chemical ingredients of the foods that our liver in high quantities undeniably harmful. All these effects of milk thistle were expertly demonstrated by many studies and its soothing effect on our body is now commonly known by doctors who often recommend it to their patients. Substances in this highly medicinal Thistle act as a whip to poisons and toxic substances in the liver, we settled down, destroy them and break down. By using milk thistle liver cleaned from these toxins and at the same time allowing them to regenerate and restore their essential function. Because milk thistle has no more or less severe side effects for the liver and contains harmful substances and chemical contaminants that commonly found in synthetic drugs is a very safe choice for their treatment. It can be used even where there should not be any synthetic drugs with lots of ingredients that could harm the liver could continue. The only cases where this herb is not recommended for use, are common in women during pregnancy and lactation, and in people with high blood pressure, in rare cases may occur allergies and reactions. If you suffer from any serious illness, preferring to advise on its application with the doctor is generally a safe herb. In some cases it can decrease milk thistle allergies. Does not work in any case, his action is needed to test individually, but are reported where it helped eg hay fever or various kopřivkách, rashes, etc. Treatment of milk thistle are recommended for people with impaired digestion, especially those who suffer from gall bladder functions. Other well-known effects as a mild increase in blood pressure, and sometimes helps with headaches, even with travel sickness as a "natural KINEDRYL". Treatment with milk thistle - tea, tablets, tincture or oil? Milk should be used for real effectiveness as a cure - regularly over several weeks or months, preferably repeatedly. It is important during the period of its application to avoid alcohol and preferably also restrict the use of synthetic drugs. The question is, what product to choose from this herb. If we want to use it to cure common detoxification and regeneration, suffices us tea from crushed seeds. But if the liver is seriously damaged our diseases or poisons, we choose rather tablets, capsules, respectively. Tincture or oil, which have a higher content of silymarin, a higher efficiency. If you know of someone perhaps who needed healing power of this prickly handsome, do not hesitate to pass on what you know about him .. Milk is a herb that can sometimes work wonders ..